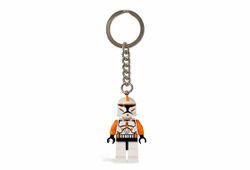 The set Commander Cody Key Chain is a Star Wars key chain released in July 2008 as part of the The Clone Wars line. Included is one Commander Cody minifigure, without the ARC armor, attached to a keychain. Facts about "852355 Commander Cody Key Chain"